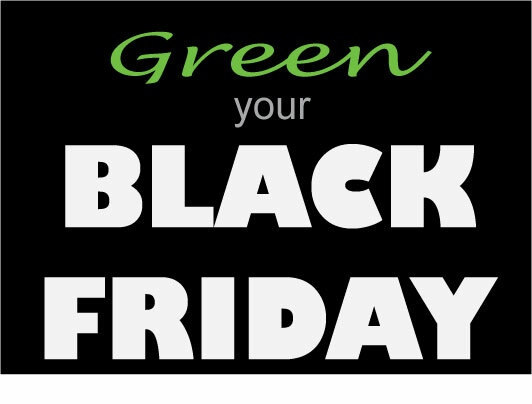 In honor of Black Friday, here are some suggestions on how to be a green consumer. Do without. When I was a teenager, agonizing over whether to buy the red shirt or blue sweater, my mother used to remind me, "you know, one of the options is to do without." Before buying something, stop and consider whether you could do without this purchase. Ask yourself whether you would be willing to pack this item up in a few months if you were to have to move suddenly. Or simply wait a week and see if you can find a different solution (or source of satisfaction) besides buying something new. Perhaps there is something you already own (stashed deep within a box or bin in the closet or garage) which you will remember that you could use instead. Because I consider shopping with children to be mild torture, things often sit on my "to buy" list for weeks or months on end before I go to the store, by which time I often discover that the item that I once thought was essential is actually entirely unnecessary. It is not unusual to decide that I don't really need or want half of the items on my shopping list. I also tend to deliberate endlessly about any purchase over $50, which often results in me buying exactly nothing. Borrow. Talk to neighbors or send out an email to friends to let them know what you need and you may find that you can borrow (often indefinitely) instead of buying. It's always nice to try something out first before buying it. You may even discover that you don't really like using or caring for the item in question. Borrowing instead of buying is an especially good idea when it comes to any and all baby gear, since your baby will hate over half of it anyway. Find it on Freecycle. Join your local Freecycle group and post a "Wanted" ad. Someone may be willing to give you exactly what you are looking for for free. Rent. If no one you know has what you need, and you might only end up needing it short-term or aren't sure if you want to own the item yourself, see if there is a way to rent the item instead of purchasing it. Fix what you already have. The ability to repair items seems to be a dying art, and getting an item repaired often seems much more of a hassle and even more expensive than just buying a replacement. How I wish we could have found someone to fix our toaster oven. But at least consider whether you can possibly repair an item you already have instead of buying something new. Here is an inspiring story of fellow green blogger Beth finding someone to help her repair her rice cooker! A few resources for fixing it yourself include IFIXIT, the Fix It Club, Repair Cafe, and of course Fix-it-yourself Books, Knowing someone who is handy with mechanical and electrical items, as well as someone who can sew, can save you from a whole lot of unnecessary consumption. Instead of Buying New, Buy Used. Craig's List. My favorite way to buy (and sell) used items. While you can save tons of money by shopping using Craig's List, it can be time-consuming. I have had the best luck on Craig's List with shopping for baby/kid items (clothing, toys, and other gear), small and large appliances, and furniture. Consult this savvy guide for tips about how to buy successfully on Craig's List. Thrift Stores. I like to shop for children's clothes, toys, books and gifts for all ages at thrift stores. Before I had kids and had the patience to try on dozens of items, I was also quite good at shopping for myself at thrift stores. Here are my tips for shopping successfully at thrift stores. One thing I love about thrift stores: if you buy something, and decide you don't want or need it, just donate it back to the store. Your purchase almost always supports a charity, and you've done zero damage to the environment. One friend of mine actually views the thrift store as a place to "rent" toys (picking out the toy is the main entertainment, and toys are returned/donated after several weeks). I usually find my local thrift stores by "searching nearby" my house in Google Maps for "thrift store" but you could also try consulting a directory. Garage Sales. If you are willing to get up early on a Saturday and have the patience to look through other people's castoffs, there are tremendous deals to be had (usually much cheaper than Craig's List or a consignment shop, for example). Find local listings in your local newspaper or Craig's List. Or just walk/ drive around your neighborhood looking for signs on the weekends. Consignment Shops. You will generally pay more at a consignment shop than a garage sale, thrift store, or even Craig's List, but the items also tend to be better organized and in better condition. You can also call the store and see if they have what you are looking for. If You Buy New, Buy Green. Buy high-quality durable goods instead of whatever is cheapest. Do a little research on reliability and quality using Consumer Reports or Consumer Search. Buy the simplest model possible, so that there is less to break and a more likely possibility of being able to repair the item if it breaks. Consider the amount of packaging (one of the best things about buying used = no packaging). Buy local; buy handmade; support your favorite eco-friendly socially conscious businesses. 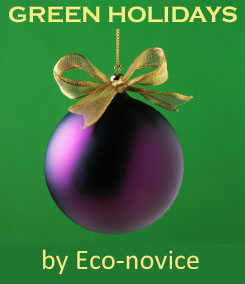 For gifts, consider giving products that reduce overall consumption, such as reusables or cookware. What is your best tip for being a green consumer? This post is for this November's Green Mom’s Carnival, which I am hosting. Check back here on Monday for links to posts by other green bloggers full of tips and suggestions about how to be a green consumer. Great tips! I love that your mom was so green! Do without is a big one for me. I think if I waited a week on half of my purchases they wouldn't happen. Borrowing is also such a great option. Especially if you only need the product for a short time. Betsy, I think you have to change your blog name from eco novice to ecoPro!! I came over to take a peek at your post before sending mine to you, and wow - you've covered all the bases! Great tips! Thanks, Lynn. I've been writing this post in my head for a long time -- it's why I suggested it as a carnival topic!